This Ongoing War: A Blog: 11-Jan-15: Does the king need to fly to Paris to stand with terror victims? He can do it better back in Jordan. 11-Jan-15: Does the king need to fly to Paris to stand with terror victims? He can do it better back in Jordan. Some 45 foreign leaders and officials will be present at the historic march in the French capital, which is expected to attract around a million people under high security. We understand how joining such august company has its attractions. But respectfully, we think HRH King Abdullah II of the Hashemite Kingdom could make a more meaningful contribution to the cause by staying in Jordan and taking steps well within his power on behalf of the victims of an earlier Islamist killing spree much closer to (his) home. Here's why. Why the JMI leadership takes such pride in the work of its journalists is easy to understand. They and their talents are the most important possible advertisement for JMI and its ambitious program. Three weeks ago, during early December, we became aware that a prominent homage had been published by JMI under the astonishing headline نماذج نجاح (translation from Arabic: “Success Model”). It was posted at http://www.jmijournalists.com/Articles/2391 but you won't find it there now. We recognized the person being honoured and were outraged. We published a critical article on December 10, 2014 in The Times of Israel ["By their role models shall ye know them"]. Then we followed it up with two blog posts on this site, one December 10, 2014, the other on December 11, 2014. 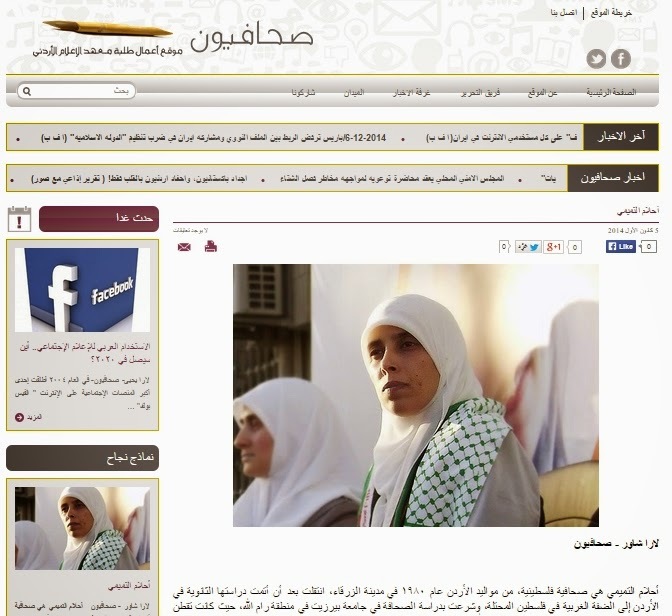 The woman honored by the journalists of JMI, Ahlam Tamimi, is the killer of our fifteen year-old daughter Malki. She was convicted for carrying out 15 acts of murder, and confessed to all the charges. Once imprisoned, she took every opportunity on television, in the written media and via social media to express pride at the killings. 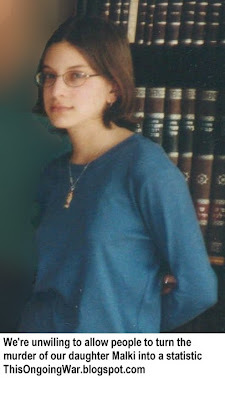 She continues to do this today, now that she is out of prison and free as a bird, released - despite the 16 terms of life imprisonment to which the judicial system sentenced her - in a mystifying surrender by Israel to an act of Islamist terrorist extortion. She lives freely and openly in King Abdullah's Jordan where she is treated as a celebrity. The obscene statement by JMI’s students calling her their 'success model' amounts to a cry for more support for terrorism as well as for the murder of more Jewish children. If the school's management is not infuriated by the way this totally betrays the principles on which it was created, they ought to be. We're not naive. We know that many, many, many people see nothing wrong with supporting the targeted murder of Jewish children, or with doing it. We know that Tamimi appears in thousands - yes, thousands - of YouTube video clips. (Check here.) Some depict her smiling delightedly as she explains she has nothing for which to apologize. Almost all of them showcase her 'achievement'. If she is sad, she says, it is only because the human bomb, a freshly-devout young man from a wealthy family and with an exploding guitar case slung across his back, died in the course of their attack on the Jewish children. Her message falls on receptive ears; she has a huge following in the Arabic-speaking world, and is the presenter of her own weekly television show, recorded from her home base in Jordan and beamed around the world by Hamas and via YouTube. The JMI journalists' website - the whole thing - was taken down in mid December 2014, a few days after our letters of complaint began arriving on the desks of officials around the world. (As an aside, whoever did it put up a fig-leaf explanation about the domain name having expired. We checked; this was nonsense, though it presumably saved someone some face.) The entire site re-emerged some days later. But now, all references to Tamimi, the murderer, had been expunged. In itself, this was a welcome development, no matter what the reasons behind it. But given what the original tribute to the terrorist/killer signifies, we did not see the matter as at an end. We also feared (justifiably as it turned out) the JMI people would bury it. So as a precaution we arranged for an archived copy - outside their control - to be posted here. Check it out. There was not a word on the main JMI site or on the JMI journalists' site about the Tamimi homage or the fact that it was removed, or why it was removed. Not in English, not in Arabic (the tribute was in Arabic), not in any other language. Nada. Clearly showcasing a jihad-minded killer of children is now seen as a strategic embarrassment. We see it as a teaching moment. In the past three weeks, we have been in contact with the people who manage JMI, as well as with most of the governments and NGOs who provide it with indispensable funding, backing, patronage, guidance and momentum. They are listed here. We have explained to them politely and patiently the matters you have just read. We presumed that, like decent people everywhere, all of them, including the JMI's leadership, are horrified by what the JMI journalists did. As the privileged beneficiaries of an unusually generous and rich program, funded in large part by foreigners, they are on a fast track to join the ranks of the best journalists in the world. A great initiative, given the huge problems facing Jordan (and the Arab world in general) and therefore an even greater shame if it turns out to have been undermined by a passion for jihad from within. It surprises us that some of the backers and sponsors have ignored us until now (we're not disclosing names at this stage). And as of tonight, the JMI people themselves have only responded tersely and without addressing the issues at all. That's why we think King Abdullah II can help. 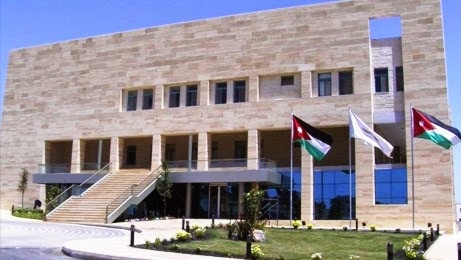 And did we mention that the Jordan Media Institute was founded by his sister-in-law? As parents who have not stopped grieving for the terrible loss we suffered at Tamimi's hands, we are going to persist with our efforts. They are intended to persuade the JMI people, including their graduate students, that glorifying Tamimi is a catastrophic miscalculation. Also, that removing the tribute made sense given the values they so prominently espouse [here] but instead of concealing their about-face, they ought to be taking pride in wiping this sociopath from their site. They should amplify that message by very publicly explaining in the languages of their backers (French, Dutch, German, English and especially Arabic) the importance of repudiating terrorism in every possible way. It's a simple enough message. If they have a problem with it, then we think their supporters may have a problem with that. There are going to be many leaders at Sunday's mass rally in Paris and their message is essentially the same as the one we are waiting to hear from Jordan. All in all, we think the Jordanians will gain hugely if their monarch chooses to stay home and address a problem that none of those other VIPs can. 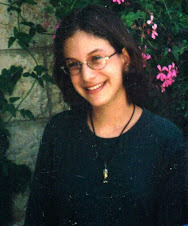 Just a brief word about the charity we created thirteen years ago (whose certificate of registration was issued on the morning of September 11, 2001, the day that later became 9/11) as a memorial to our daughter's life. The Malki Foundation does exceptionally fine and meaningful work for the benefit of thousands of families including Druze, Jews, Moslems and Christians on a strictly non-sectarian, non-political basis. It exists purely to do good – the exact opposite of the hateful evil that Tamimi, the JMI’s “success model”, represents. A version of this post appears today at The Times of Israel.